Lead is found in many places in our environment. Lead is constantly taken into our bodies and constantly eliminated. However, unusual exposures to lead may upset the balance and push the overall total body load to dangerous levels. 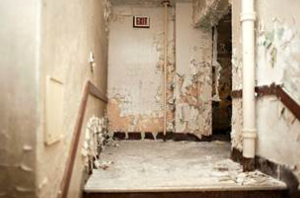 EHS conducts surveys of building materials on campus, generally in support of renovation or demolition projects. Housing facilities have been evaluated which were constructed with specified years. EHS has a NITON XRF, which is the most up to date portable lead analyzer available. EHS personnel are certified to operate the XRF and to conduct evaluations in buildings. For more information about lead on campus contact EHS at 348-5905. The University has a lead-based paint abatement team trained and certified in the proper techniques to remove lead-based paint from problem areas. Their expertise includes the removal or encapsulation of lead-based paint on surfaces, in dust or soil; and the replacement or removal of any building component coated with lead-based paint.